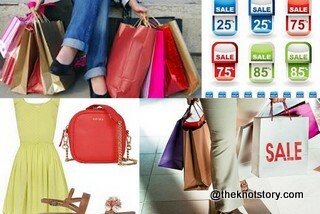 Its monsoon and the sale time is here. Since I already spent big bucks yesterday I thought I would jot down some important do’s and don’s while shopping in the sale. The very thought of sale shopping is rejuvenating. Anything at the cost lower than the printed one is always welcome to anybody. Who does not like saving. Remember we gave you a list of to do’s while shopping for the black Friday sale? Refer all of that and brush-up your sale shopping skills. Along with that remember the following in order to help you avoid all that you don’t wan to end up buying! Stock up on winter collections as the weather next is appropriate. Woolens are always expensive to buy retail. So sale is the appropriate time to stock up on that. Go buy all the footwear that you have your eyes on. Spending on denims during sale shopping is also a great idea. Even if the trends change a decent pair of denim wouldn’t really hurt. Household decor items are also to look out for when you are shopping during the sale. Furnishings like Bed-covers, Bath linens are again some important items that you could or you would wanna spend on. Electronics items which you have been keeping on hold since a long time. Buy cosmetics as much tempting as it is. You cannot guarantee the expiry date. There is a possibility of products being very near to the expiry date. Buy neon colors , since are so much in fashion these days it may tempt you. But they aren’t here to stay long. It may be a possibility that 3 months later you may regret buying so many neon’s after all! Buy too many leather items. Remember its monsoon time after all. Buy footwear which you plan to use this season and aren’t weather appropriate. Forget to check your bill the percentage discount and any discrepancy where product guarantee is concerned. This entry was posted in Shopping, Wedding / Marriages and tagged 2013, discounted shopping, Discounts, Monsoon sale, Monsoon sale shopping, People, sale shopping, shopping, shopping spree, style. Bookmark the permalink.